“The Gujarat government has been giving land to the corporates, but it has failed to give land to the landless Dalit and tribal communities,” says Gova Rathod, convener of the Jamin Adhikar Jumbesh, a network of land rights organisations like Gujarat Dalit Sangathan, Saurashtra Dalit Sangathan and Adivasi Mahasabha Gujarat, in the state. Now to assert their rights the organisation has decided to hold a mass protest in Gandhinagar on November 26. “The government from 2005—when it released a notification allowing the granting of wasteland to business houses for corporate farming—till last year has given 27,000 hectares of waste land to 55 industrialists, but has failed to give even an inch to the tribal and the Dalit community of the state,” he adds. The state, according to the 2011 Socio Economic and Caste Census, has around 55 per cent landless rural households. In a notification dated May 17, 2005, the government, according to Rathod, introduced the concept of large corporate farming, as it was seen as more profitable than agriculture practiced on small land holdings. “The government is planning to give 45 lakh hectare of cultivable wasteland to corporates for farming. It has not gone back on the provision of the Land Ceiling Act, 1961 that talked about giving land to the landless people in the Dalit community for farming. Despite repeated petitions and judicial orders, the government has not implemented that Act properly, giving out token amount of land here and there,” said Jayanti Makadiya, President of the Gujarat Dalit Sangathan. The land rights protest by the Jamin Adhikar Andolan has been going on since December last year when 1.25 lakh claims for land were sent to the state administration. This was followed by adharna in 73 blocks on May 5. This was then escalated to another dharna in front of five district administration offices in October. “At every step, we have not heard a single word from the government. We had told the government that if our demands aren’t heeded to, then we’ll organise a massive protest in Gandhinagar. We are going to do that now. Already around 75,000 people have registered to come for the protest,” Rathod said. 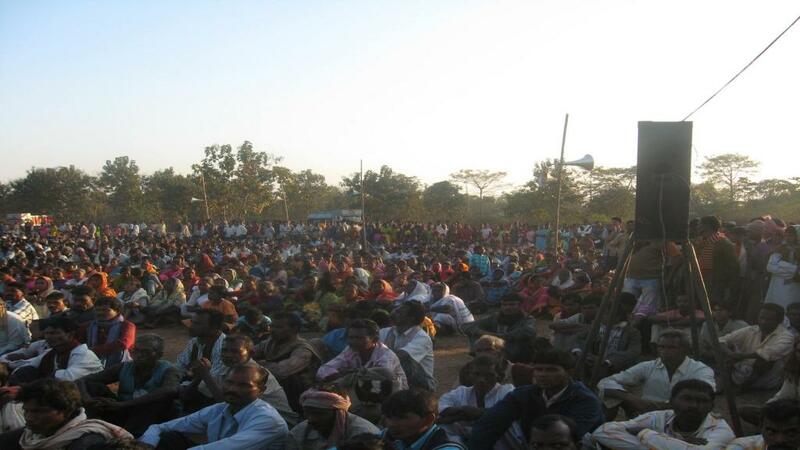 The demands of the Jamin Adhikar Andolan include proper implementation of the Scheduled Tribes and Other Traditional Forest Dwellers (Recognition Of Forest Rights) Act, 2006 (FRA). According to the latest Monthly Progress Report, August 2018 on the implementation of FRA of the Ministry of Tribal Affairs, only around 46 per cent of the claims filed between 2008 and 2018 were approved and moreover, titles deeds for only 45 per cent of all the FRA claims approved have been disbursed by the state till August 31. “There are around 2,000 villages in Gujarat were Dalits do not have cremation grounds. The community is not allowed to use the cremation ground of the dominant caste. One of our demands from the government is to provide cremation grounds in these villages,” Rathod said.